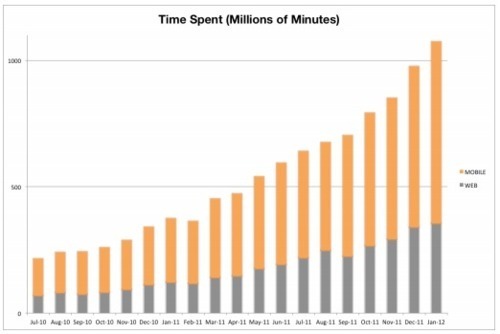 Wattpad Hits 1B User Minutes A Month! Wattpad, aUnion Square Ventures-backedplatform for sharing stories and interacting with writers, has been growing steadily, and it hit a nice milestone in January — during that month, users spent more than 1 billion minutes on the service. Co-founder and CEO Allen Lau tells me via email that the growth comes from a combination of attracting new users and convincing each of those users to spend more time on the site. The average session for Web users was 30 minutes, while visitors on Android devices spent an average of 28 minutes.